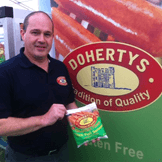 Doherty Meats from Derry/Londonderry supply Gluten Free sausages which we, and many others, have sampled and can thoroughly recommend. They were at the recent Tesco Taste NI festival in Belfast and had a very busy few days! We have been hearing very positive reports about BFree Wheat and Gluten Free bread so we have had a chat with the makers and they have told us some really great news! First of all, because it’s so popular, they have now made it available in Ireland in Dunnes, Tesco, Supervalu, SuperQuinn and Centra stores! And very soon they are coming to Northern Ireland! Watch our Facebook page for the “when” and “where” and you will know as soon as we have the details. The Autumn edition has just been published and, as usual, is full of interesting facts and articles about the food scene in NI and the border counties. In fact, in this edition they are talking to restaurant owners as far south as Drogheda and as far west as Sligo where they interview Seamus Thompson at Eala Bhan about his Gluten Free offerings. Send Kathy an email if you want to sign up for their magazine or find out where to buy it – it’s great value! If you have come across a new Gluten Free product that you believe would be of interest please tell us about it and share the experience. It would seem, from comments we are hearing and some blogs we have been reading, that the EU Gluten Free labelling legislation which came into force back in January this year is not necessarily having the effect the creators had in mind! These regulations apply to all foods, pre-packed or sold loose, such as in health food stores or in catering establishments. The new labelling standards are an important public health measure to help protect the long term health of coeliacs. These labelling standards will enable coeliacs to make informed choices about the foods that are safe for them to eat. Where caterers are unable to justify ‘gluten-free’ or ‘very low gluten’ claims because of the risk of cross-contamination, if steps have been taken to control this contamination, caterers will be able to indicate which foods do not have gluten-containing ingredients, allowing coeliacs to make choices based on their individual levels of sensitivity. “These labelling standards will enable coeliacs to make informed choices about the foods that are safe for them to eat. However, it’s apparent from some of the blogs we have read and comments on the web that some Coeliacs are not finding the new rules at all helpful. Furthermore, it is clear that many establishments are not complying with the letter of the law, probably through ignorance, and some of the major Gluten Free manufacturers have decided to stop issuing lists of their GF products and are telling Coeliacs to “read the ingredients” to decide for themselves. “Thanks for asking about the gluten free status of our products. On 1 January 2012, a new law was introduced to cover how foods can be labelled with claims about gluten. As you may know, it’s not always possible to make food gluten-free, and until recently there was no legal definition of what ‘gluten-free’ meant. The majority of our factories are not grain-free and therefore the products made in them cannot be classed as ‘gluten-free’. Whilst we recognise that consumers like to have lists of suitable products for their diet, this legislation change means that we are no longer able to provide these. Therefore, at Mars we always encourage consumers to read the ingredients list to be clear when a product contains any allergenic ingredients as part of the recipe or in trace amounts. For a gluten intolerance or allergy, such ingredients would be cereals such as wheat, barley, rye and oats amongst others. Once again, thanks for getting in touch. Not very helpful, especially for a newly diagnosed Coeliac trying to find their way through the Coeliac pitfalls! Here’s a website that just might tickle your taste buds –www.aquarterof.co.ukA Quarter Of is ‘an old fashioned sweet shop’, online, but more importantly, they stock a huge range of gluten free goodies! Our Facebook page is now very popular and, to date, we have 645 “Likes” which is pretty good but leaves lots of room for improvement! We get a reasonable level of interaction on our page but, again, we would love to see more folk use it to tell everyone about their favourite GF watering holes, support groups, or whatever Coeliac related experience you have had! The NITB has added us into their Discover Northern Ireland web site – www.discovernorthernireland.com/food as they recognise the demand from visitors for Gluten Free food and the need for Tourist Information Centres to give suitable advice. www.allergyshow.co.uk – Opportunity to visit the Allergy + Free From Show in Liverpool – 27 – 28th October 2012.